Rock Paper Lizard: Things that live in sand. Part 3. Things that live in sand. Part 3. 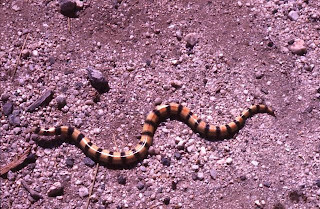 The Variable Sand Snake, Chilomeniscus stramineus, is a small snake from Arizona and northern Mexico, including much of Baja California. There may be populations in southern California. It is hard to find because it spends most of the time underground, “swimming” through sandy soil. It’s one of many species of small squamate reptiles (snakes and lizards) that live in the upper layers of friable soil and prey upon invertebrates such as grasshoppers, cockroaches and centipedes – attacking from below, Tremors-style. 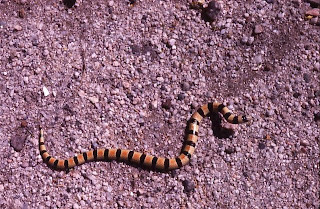 This snake shows a morphology adapted to sand-living found in numerous squamate groups. The head is narrow and bevelled in profile, like the front of a bullet train. Valves keep sand from nostrils, and the lower jaw is countersunk within the upper. Scales at the front of the head are enlarged, facilitating pushing through substrate, and scales of the body are polished, reducing friction. The body is arch-shaped in cross-section, with a concave ventral surface. This form resists loading from above and helps transfer lateral forces from the trunk to the surrounding soil. This particular individual was found at night, on the surface of the sand among dunes on a beach on the Gulf of California, south of La Paz, Baja California Sur. It was captured by a disoriented graduate student, stumbling around under the influence of painkillers (due to a recently broken arm) and cerveza (due to being in Mexico), returning from a campfire, with no clue where he had set up his cot. That’s probably the only way anyone ever finds one.